Simcom offers a range of 2G and 3G M2M modules. All the modules offers a rich set of AT command interface for developing IP-based applications. This tutorial is intended for developers building M2M applciations with Simcom modules. With the online AT command tester tool, this tutorial explains how to to test different AT interfaces available on Simcom modules. How to connect to the Simcom module? 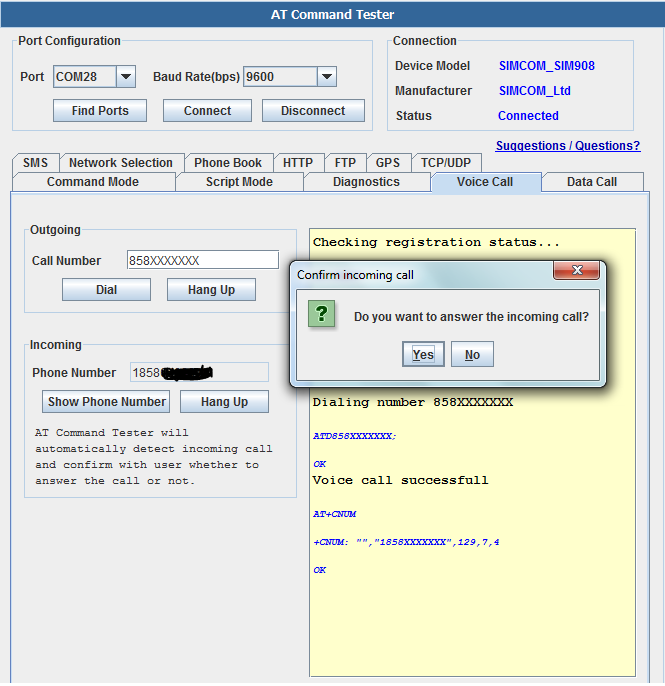 AT command tester is a free online software tool that is used to test AT commands and other module features such as data call, voice call, HTTP, FTP, TCP/IP, GPS, Email and other functionalities of M2M modules. How to connect to module? Please check that the drivers for the module are installed on your system. The module is then connected to the PC through a USB or serial connector interface. The module is typically on the hardware development kit (HDK) or on the host platform. AT Command Tester uses Java-based serial drivers to interface to the modem. Users can connect to the modem serial port. It is assumed that modem is connected to the PC and ATc commands can be sent to the modem serial port. In the ‘Command Mode;’ users can send single AT commands and get the responses. The dropdown lists 3GPP AT commands, description and examples for each AT command. Users can perform basic troubleshooting of the modem diagnostics under the ‘Diagnostics’ tab. Here the AT Command Tester tool sends the required AT commands and provides descriptive output about the state of the modem. //Serial port flow control on host device and modem side. Signal level is -71 dbm. Signal condition is excellent.The signal strength range is -53 dbm (Excellent) to -109 dbm (Marginal). Engineering mode is OFF. To turn on Engg mode, set AT+CENG=1,1. Device is ready for phone call. //Is the modules configured for server mode? FTP is configured for Passive mode. FTP transfer type is binary. //Connecting to PDP profile 1..
AT Command Tester provides easy to use interface to send/receive SMS messages. 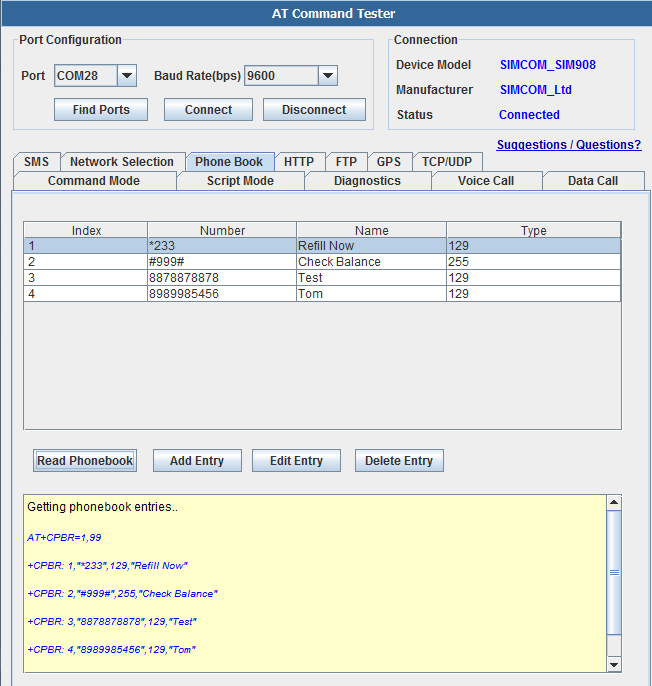 SMS message format can be text mode or PDU mode. The HTTP function is only implemented for the SIMCOM modules. Users can test HTTP Get and Post using the AT Command Tester.HTTP connection uses bearers that need to be setup. ‘APN’ is unique to each network. Usually you can do a Google search for a network’s APN. Once bearer is set-up, then a bearer connection needs to be set-up. After the bearer has a sucessful conenction, an HTTP connection can be established. This allows users to test FTP Get and Put functions using the SIMCOM modules. File Transfer Protocol (FTP) is commonly used to send/receive files from a remote server. First a bearer connection needs to be established just as we did in the HTTP example. After a bearer has a successful IP connection, we can use the FTP AT commands as shown below.